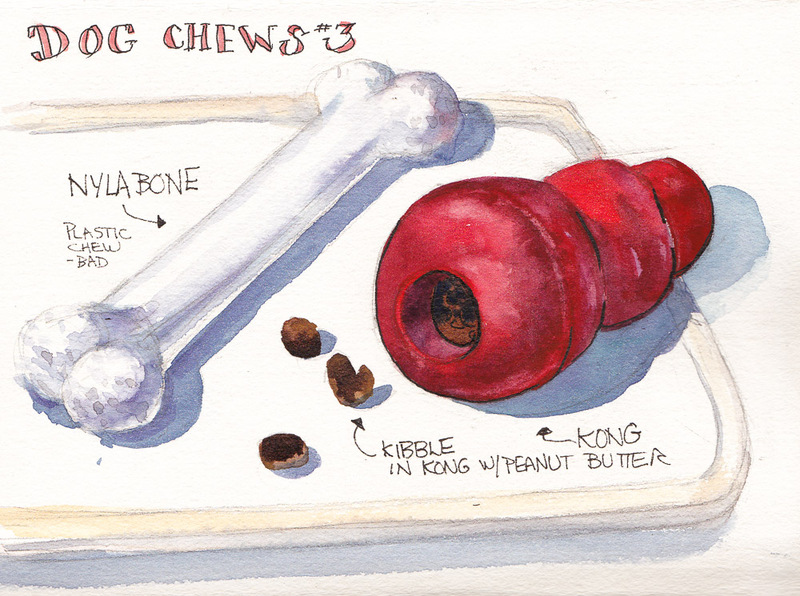 These two dog chew toys, the NylaBone and Kong, have been around for a long time. The NylaBone is made of plastic and shaped like a cartoon version of a dog bone. It has no flavor or scent, but must be attractive to some dogs since the company still makes them. Millie gave it a half-hearted chew, leaving a few teeth marks, and then abandoned it. They’re not recommended by most experts since bits of indigestible plastic break off and get swallowed. (Nylabone’s website says that they are non-edible and should only be given to puppies with baby teeth, never to dogs with adult teeth, which I didn’t know when I bought it). It’s not that Millie is opposed to chewing up plastic stuff though.Yesterday she completely shredded one plastic planter pot and buried another in the yard. At least she doesn’t chew up remote controls, hats and shoes like my son’s dog did in her early years. The Kong is made of rubber and is meant to provide doggie entertainment and mental stimulation. You stuff the hole in the middle with kibble mixed with Kong cheese whiz spray or peanut butter. The pet store actually sells jars of peanut butter for dogs. Since I don’t eat peanut butter myself, I bought a jar of the dog butter (I’m a sucker, I know!). Millie made a lackluster effort to dig out a little of the kibble-peanut butter mix but didn’t show any interest in chewing on the Kong itself. A couple days ago she gently and lovingly chewed all the plastic buttons off of my favorite fleece pajama top that I left on my bed. Since she always chews the eyes and ears off of stuffed animals I give her I guess I shouldn’t be surprised. I’m really enjoying this series of drawings. Degas didn’t like the rubber bone and actually barked at it before ignoring it. She does love plastic though – yoghurt cartons and drinking yogurt being among her favourites, but then she’s a yoghurt addict. No remotes – YET. She also takes eyes and ears off soft toys, but the destuffing is her faourite part – especially from cushions as you’ve seen. Haha. Yep! Plastic containers, ears, eyes and destuffing…whoopee! I’ve got lots of yogurt containers. Maybe I should give them to her to shred so she’d leave my tenant’s planters alone. This series is so adorable. I love it.